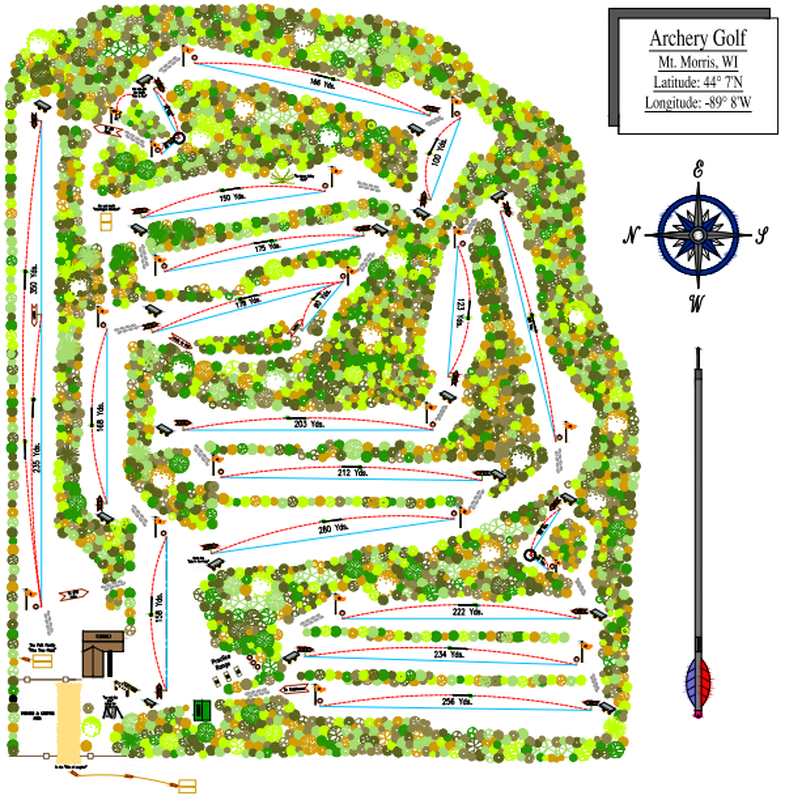 The archery golf course is situated on 130 acres of wooded countryside along Highway W, east of Mount Morris; just past 24th Avenue. Like any golf course, each hole has tee offs, fairways, and greens across the 18 holes of varying difficulties and hazards. Our archery golf course includes two “doglegs” and 3,382 yards of rolling hills and natural shooting challenges that will entertain any skilled or novice archer. Our course design allows for adjusted distances and reduced difficulties for archers using lower poundage bows. Our scenic course also has an abundance of Wisconsin wildlife that will be evident as you walk our course. ►The course is not open during the hunting seasons. ►We offer rustic camping sites on the grounds. ● Lost arrows found by other archery golfers are returned to the “Lost Arrow” drop on the club house next to the Loot Shoot. ● Lost arrows can be identified and collected by the owners during our season shoots. ►The Club House is open on our Shoot weekends for registration, food and beverages. ● Archers can purchase food, digger tips and arrows. ● Archers can review their scores and standings as the shoot progresses. Hole 1 (par 2) is a 158 yard hole with straight and generally flat fairway. Hole 2 (par 2) is a 168 yard hole with a slight uphill grade and several over hanging trees on both sides of the fairway. Hole 3 (par 2) is a 178 yard, uphill-elevated hole with a dense ravine of brush that opens to a tight green. The Women’s tee is a 90 yard shot over a corner of the same wooded ravine. Hole 4 (par 2) a 175-yard hole with a panoramic, downhill tee off over trees to the fairway that opens up 100 yards off the ball. Hole 5 (par 2) is a 150-yard hole with a sharp uphill fairway with a green positioned on the side of a hill. Hole 6 (par 2) is a 100-yard hole with a steep downhill tee off to the ball, positioned 14 yards in front of a marsh. Hole 7 (par 2) is a 166-yard tee off from a platform and shot over left-to-right sloping landscape. Hole 8 (par 3) is a 110-yard dogleg. From the tee off, the first shot is to land an arrow in a 3-yard diameter ring 74 yards away before the archer can shoot at the ball. Once in the ring, the ball is positioned 36 yards away for a tight but un-obstructed shot in a wooded setting. Hole 9 (par 3) is 350-yard hole with a straight-away fairway that begins narrow and opens up for a spacious green. The Women’s / Cadet’s / Junior’s tee off is shortened to 235 yards. Hole 10 (par 2) is a 280-yard hole with a wide and flat fairway. Hole 11 (par 2) is a 212-yard hole with tee-off that gives the archer a tight view to the green then opens up to a sandy fairway and green. Hole 12 (par 2) is a 203-yard hole with a fairway that ends with a steep incline up to the green and the ball is placed on the steep grade close to the top of the hill. Hole 13 (par 2) is a 123-yard hole that lays on a gradual slope with an un-obstructed view to the ball. Hole 14 (par 2) is a 228-yard hole with a narrow fairway and a green that is elevated above the height of the fairway. Hole 15 (par 3) is a 161 yard dogleg. From the tee off, the first shot is to land an arrow in a 3-yard diameter ring 105 yards away from the tee before the archer can shoot at the ball. Once in the ring, the ball is positioned 56 yards away for an un-obstructed shot at the ball. Hole 16 (par 2) is a 222-yard hole with a straight but narrow fairway. Hole 17 (par 2) is a 234-yard hole with a straight fairway and slightly elevated, level green. Hole 18 (par 2) is a 256-yard hole with a straight fairway that opens up into a wide green area.